TurfWinch TW2000 winds artificial turf with or without infill material into transportable rolls. The maximum roll width is 2 metres. Height adjustable support rollers facilitate handling. The winding speed is adjustable and can be activated from the driver seat by the Hand-held steering. TurfWinch TW2000 can be operated through di fferent adapters with all available loaders. Operation requires a loader or a tractor with at least 20kW (27HP) drive power and a oil capacity of 25 litre per minute. 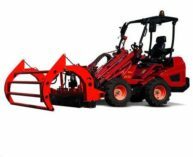 We recommend a continuously variable hydrostatic transmission drive or crawling gear.